The letter ‘R’ is a bumper letter for this ABC and it’s tempting for me to write about the 7 ‘R’s. I originally developed the 7 ‘R’s to use on primary teacher education courses in order to encourage teachers to reflect on initiatives they could take to establish positive working parameters with a new class. The 7 ‘R’s are: Relationships, Rules, Routines, Rights, Responsibilities, Respect and Rewards. For each ‘R’ it is important to have a vision of how you would ideally like things to be in your classes, and then work pro-actively, patiently and persistently to make it happen. I have written about the 7 ‘R’s in detail elsewhere (1), and so here I plan to focus on the one I believe is the most fundamental: Relationships. If you think back to a teacher you had at school who made a positive difference to your life, the chances are that the reasons will include something to do with your relationship. No matter how knowledgable, skilled, trendy or cool, it’s almost always the affective side of things that tips the balance into making a teacher, and the accompanying learning experience, memorable and have lasting impact. Some years ago, I was curious to find out children’s perceptions of their teachers rather than rely only on the hindsight that comes with adulthood. Inspired by another survey I had read about, which had been carried out with adults (2), I decided to conduct a similar small scale survey of 120 children between the ages of six and eleven at a local school in Madrid (3). 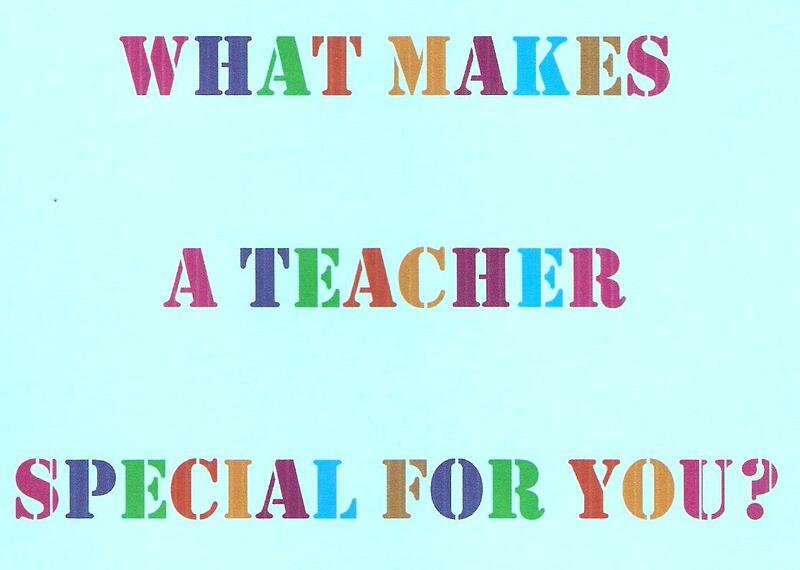 In replicating the adult survey, this survey consisted of one question only (translated into the children’s first language): What makes a teacher special for you? The children were invited to respond in their first language, noting down as few or as many ideas that came into their heads in any way they liked. The survey was explained and administered by the children’s class teachers. From the children’s responses, a set of qualities were identified and then scored. These overwhelmingly reflected children’s own perceptions of the ‘special’ importance of their relationships with their teachers. The qualities included teachers who are fair, patient, caring, affectionate, kind, funny, listen to you, help you, make you work, treat you as a ‘person’, tell you off if necessary, but don’t get angry or shout. With younger children, there was a tendency to include physical factors such as ‘good-looking’, ‘wears nice clothes’, and even ‘smells nice’! With older children, there was a tendency to focus on other aspects of teaching, in addition to relationships, such as ‘makes lessons interesting’ and ‘explains things clearly’ although these categories were perceived as less important than other qualities in the overall scoring. Learn the children’s names as soon as you can and always use them. Avoid having favourites (or at least make sure that this doesn’t show). Listen to what children have to say (if a child wants to tell you something at an inappropriate moment, postpone till later but don’t then forget, as this will give the message that you’re not really interested). Distribute your attention equitably round the class; try not to fall into the trap of paying most attention to the children who are most demanding. Build up children’s confidence and self-esteem and encourage them to believe they can succeed. Be patient if you need to explain or give instructions more than once. Create time for personalised moments in which you convey that you know and care about each child as an individual. This may be, for example, at the start or end of lessons before or after formal teaching begins or while children are working individually. Model behaviour that you would also like the children to adopt. For example, be polite and courteous, use ‘please’ and ‘thank you’ when you ask them to do things, smile and greet them whether in or out of the classroom. Use praise appropriately to provide constructive feedback and encourage participation and effort. Use inclusive language to create a sense of community e.g. Let’s … / Today we’re going to … etc..
Use humour and show a sense of fun. Be fair and firm about enforcing rules and insisting on children’s adherence to classroom norms. Be flexible. Offer children choices about what to do and how to do it whenever you can. Be ready to ‘go with the flow’ and adapt what you were planning to do if children seem particularly interested (or uninterested) in the content of the lesson. Keep calm at all times; try not to raise your voice or shout. If you tell a child off, make it clear it’s their behaviour that you don’t like, not them. Respect children’s personal space. Try not to tower over them or move too close which may be threatening. Be consistent. If you say that you or the class will do something, make sure it happens. Mark and return work promptly. Be constructive in your comments and respond to children’s intended meanings, rather than just language accuracy or spelling. Make children feel special regularly e.g. by celebrating their birthdays, appointing a ‘Special child of the day‘ e.g. once a week, doing activities such as thought tunnels and circle time deliberately designed to raise levels of personal self-esteem. Above all be sincere and genuine – even very young children can sense if their teachers are faking it. As you develop your relationship with different classes and children, it is a good idea to get into the habit of monitoring yourself and how things are going. Through reflection and analysis of your own behaviour (the only person in the class whose behaviour you can actually change), you will be able to identify aspects of this that make your relationships work better and produce a more positive response in the children. Notes: 1) The 7 ‘R’s are described in detail in 500 Activities, Macmillan Education. 2) I read about the adult survey in an article (I think) by Michael Berman. I haven’t been able to track down the exact reference and will be grateful if anyone knows, so I can add this. 3) The survey was carried out at Arturo Soria School with the help of my friend and colleague, Ana Soberón. 4) The general points on establishing positive relationships with children are an extension of ones suggested in 500 Activities. Let me start by saying this is a fantastic post full of useful advice! It’s one I’ll certainly be sharing with my colleagues, new and old. I have also learned the importance of establishing good relationships with children. Once that is done, everything else (positive learning environment, good classroom management, willingness to learn) follows. If the kids trust their teacher and feel secure, they can have a much richer learning experience. Names are certainly important with new classes. So many times I’ve heard children excitedly whisper to each other “he knows my name!” atfer I’ve called on them (and I’ve also seen their faces drop as I struggle to remember!). The personal deatils are also important. As much as names, I try to remember my students’ pets, hobbies and anything else important to them, which I then ask about regularly (in fact, I wrote a blog post about it recently: http://prestwickhouse.blogspot.com/2010/08/guest-blog-building-positive.html ). As for marking homework and projects, as well as returning work promptly and commenting on meaning, I find they also love it if I ask follow-up questions connected to the content. My students often approach me during or after the lesson to respond to what I asked. Many thanks for your positive comments and interesting response. I completely agree with you that once you have good relationships with children, everything else tends to fall into place and the kids (and you!) have a much richer (teaching and) learning experience. It’s interesting that you picked up on the importance of names and personal details – so basic but so crucial, and many thanks also for the link to your blog which I’m sure other people will find interesting and useful too. Your point about follow-up questions related to the content of children’s work conveys the strong, implicit message that you’re genuinely interested in them and value what they have to say – and it doesn’t take ground-breaking psychology for us as teachers to realize that this is fundamentally what it’s all about. Many thanks again for your great contribution! Lovely post with lots of great points all highly relevant and useful to the teacher of young learners. Thank you for sharing this, Carol. Thanks so much for dropping by and so glad you liked the post.